When you're shopping at Westshore Plaza located at the corner of Kennedy and Westshore Blvd in Tampa, you might want a bite to eat. But two eateries inside the mall's food court had to stop serving food last week because of dozens of roaches in the kitchen. 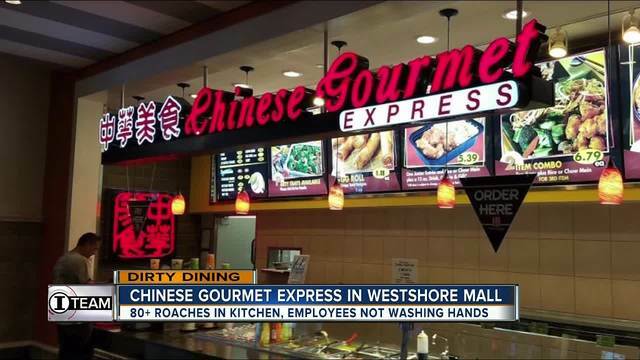 On May 3, Chinese Gourmet Express closed overnight after inspectors saw over 80 dead roaches in all areas of the kitchen and live roaches by the cooks line, rice cooker and box of sodas. Inspectors also noticed an employee use the bathroom and then engage in food preparation without first washing his hands. And they documented the chef was on his cell phone while preparing food and not washing his hands. Sansei Japan also had to temporarily close last Wednesday because it appears that they share the same kitchen and all the same violations existed on Sansei's inspection report. ABC Action News anchor Wendy Ryan left messages at both Chinese Gourmet Express and Sansei Japan but no one ever called her back. The safety of our shoppers is our top priority. The restaurant tenants have successfully addressed all issues and have since reopened for business. All of our restaurant tenants are responsible to oversee their respective operations, code adherence and preventative maintenance.